Our Food 'n Flix pick this month is the 2009 Italian film I Am Love starring Tilda Swinton. I watched this movie when it was first released on dvd and remember not really liking it. That being said, I believe in second chances, so I went in with a clear head when I popped the dvd in again this week. Unfortunately, it still wasn't my cup of tea. But all was not lost, because while I found the movie to be painfully slow, it did feature some beautiful scenery and delicious food to keep me in front of the screen. The movie starts in Milan in the home of the wealthy Recchi family. Food is being prepped, silver is getting shined, and the scene is being set for a family meal to celebrate the grandfather's birthday. He announces his retirement from running the family business, which he will be entrusting to his son and grandson (because it will take two to take the place of one of him). As the movie unfolds, we witness witness most things with a focus on the mother/wife figure in the film, Emma. Although she married into this family and took on the identity of Italian martriarch, we see that she is somewhat wistful when speaking of her Russian roots. She seems lonely being home by herself as her husband and adult kids are always busy doing things that don't involve her. An awakening of sorts happens when she bites into a dish of Prawns with Ratatouille and Sweet-and-Sour Sauce prepared by Antonio, a chef friend of her son Edo, when out at a restaurant with her mother-in-law. The voices around her fade away, leaving a bubble of bliss surrounding her in the moment. It seems to be this moment that sparks a desire in Emma, which eventually leads to a sultry love affair between Emma and Antonio. Emma feels a passion and the ability to reconnect with herself when she's with Antonio, which inevitably tears her family apart. It doesn't sound boring, does it? Yet, it kind of is. Both Milan and London, while beautiful in their own right, are portrayed in a stark manner that contrasts with the warmth of the scenes set in Sanremo. As far as food goes, aside from that moment of awakening for Emma that I mentioned earlier, some of the other things shown are a cake that looks sort of like a sandy mountain, a dish of Eggplant and Elderflower, some sort of Russian salad that is crisped with a kitchen torch, Leghorn-style code (served with some sort of pink mousse), Marinated Egg Yolk with pea cream and zucchini flowers, mixed fish with crunchy vegetables, herbs, raspberries, and wine. Soup was mentioned a few times. In the beginning, Emma mentions adding saffron to the soup. 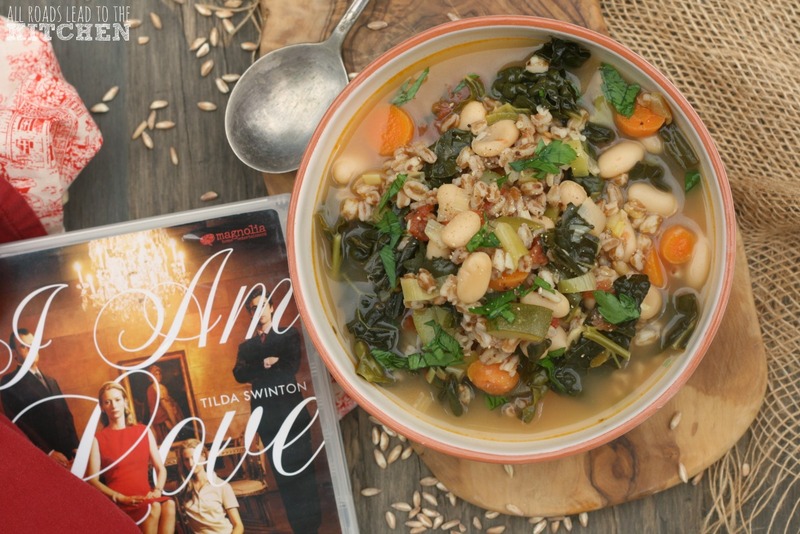 Ukha, a Russian fisherman's style soup with "lots of different kinds of fish" and "a clear broth" was actually an integral part of the story, connecting Emma to her Russian upbrining and to her son Edoardo, who loves it. She then shares it with Antonio, which Edo sees as a betrayal and a revelation of the affair. Which then leads to a tragic scene...which is what kept me from making it today. I just couldn't, it was too heartbreaking. So, I decided to use inspiration from the other mention of soup. About halfway through the movie, after Emma and Antonio are alone together for the first time, she comes home to her empty house (aside from the staff) in a state of ecstasy and as exits her bathroom, toweling off, she tells Ida that "something smells good"—to which Ida replies simply, "I made Spelt Soup". 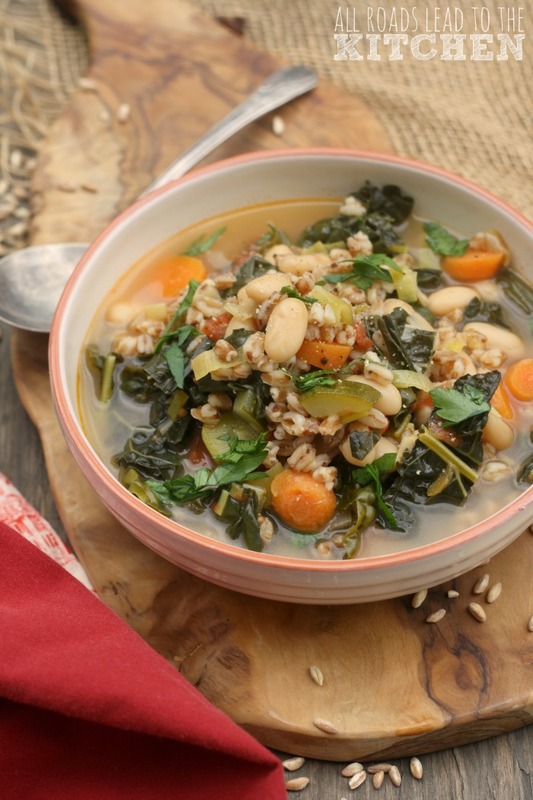 This brothy soup is loaded with chewy spelt or farro, cannellini beans, and fresh vegetables like zucchini, carrots and kale. Perfect any time of year. Heat olive oil in a 4-quart Dutch oven over medium-high heat. 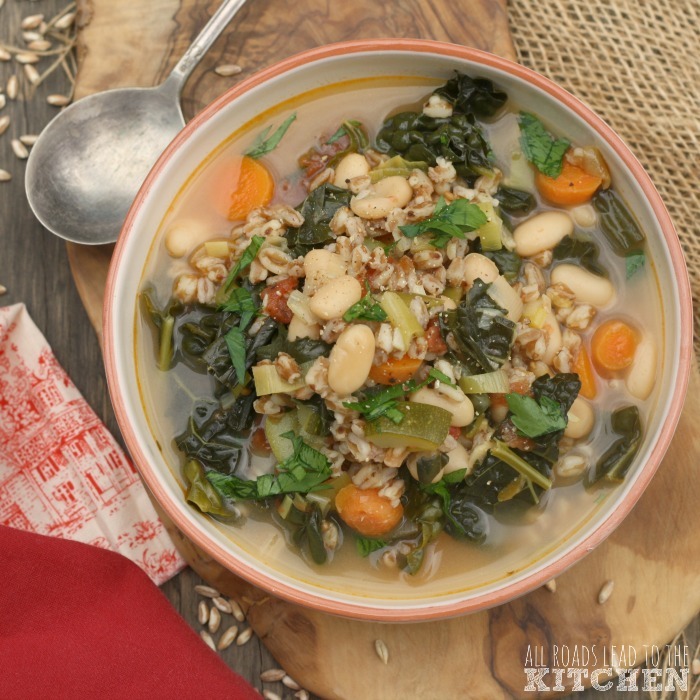 Add spelt and cook until toasted, stirring often, 3-4 minutes. Add the crushed fennel seeds and red pepper flakes and stir for 30 seconds longer. Reduce heat to medium and add the leeks, carrot, zucchini, garlic, and kale to the pot and stir, letting cook ~3 minutes. Add the tomatoes to the pot, crushing them in your hands as you drop them in. Add the stock, beans, Parmesan rind (if using), bay leaf, thyme sprig, and black pepper. Bring to a boil, then reduce to a simmer and cook until spelt is just tender, ~25 minutes. Remove and discard the Parmesan rind, bay leaf and thyme sprig. Taste and adjust seasoning to taste with salt and black pepper. Serve in warm soup bowls with a smattering of chopped parsley on top. 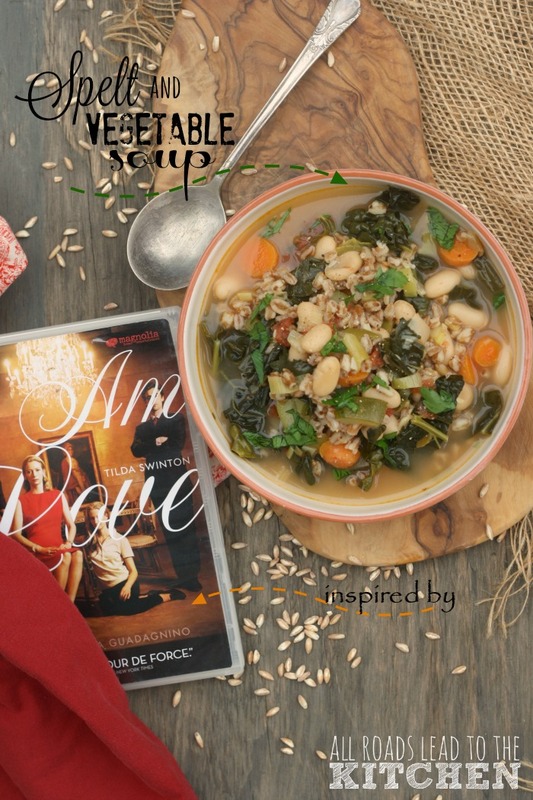 This month's edition of Food 'n Flix is being hosted by Evelyne of CulturEatz with her pick, I Am Love. If you're a blogger and would like to join us in the kitchen with this pick, submissions are due by June 20 (so you still have lots of time)! Join us next month when we watch Popeye with our host Elizabeth from The Lawyer's Kitchen.